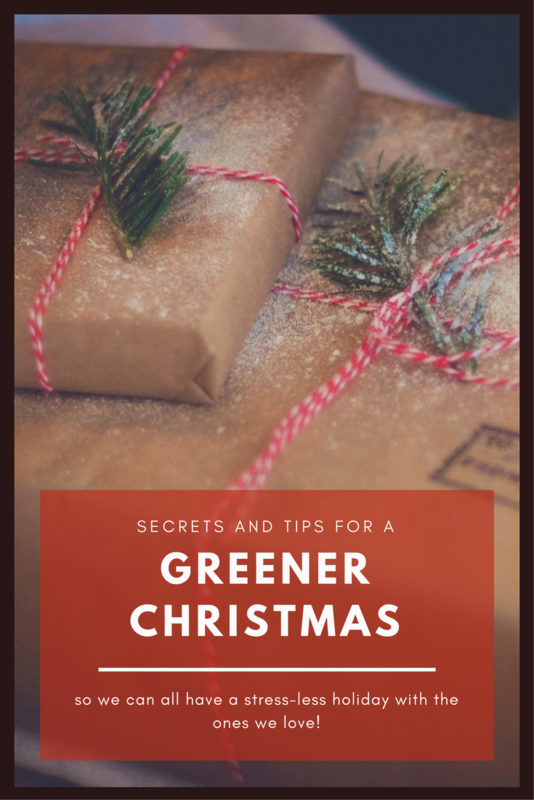 Top Tips for a Green Christmas that won't stress you out! So you may be wondering why you might want to have a Green Christmas. Maybe you think it's impossible to have a relaxed Christmas with a goal of going green. Before you skim through this post, take a deep breath right now. Are you holding tension or are you relaxed? Chances are you were browsing Pinterest or on the web looking for ideas for the best Christmas ever. Take a moment to stop and think about your most beautiful holiday memories. If you're like me, those involve experiences and people more often than remembering the items you received. What if, this year, you gave yourself the gift of a less stressful holiday season? One that left you refreshed as opposed to in debt and exhausted? It's easier than you think. Give yourself grace and please don't guilt trip or judge friends and family members who choose not to implement eco-friendly ideas at the holidays! A friend of mine recently told me she wasn't able to do that “unpaper towel thing” that I started doing this year. I was quick to explain to her that I am not able to implement everything either. These are my goals, but I'm not going to beat myself up for using a paper napkin! You'll find no judgment here. If doing these things stresses you out, then that is not sustainable for you! Gardens are a great way to go green but not for me because I am not a gardener-type and I end up feeling like a failure. That is not sustainable personally so I don't grow my food, but I do buy from local farmers! These Green Holiday suggestions are merely thought-provoking ideas to get you, your family and friends thinking about ways you *can* go green. We talked about this at the Thanksgiving Dinner table this year and two of my daughters mentioned how stressful going green can be. The reason being they start to feel personally responsible for everything. While I want them to feel that it is their responsibility to take care of the earth I don't believe “guilt” is productive. Guilt makes you miserable and is a terrible motivator, instead give yourself a high five for every step you take in the right direction. Remove the guilt from the equation and instead focus on your success each time you make a small change. 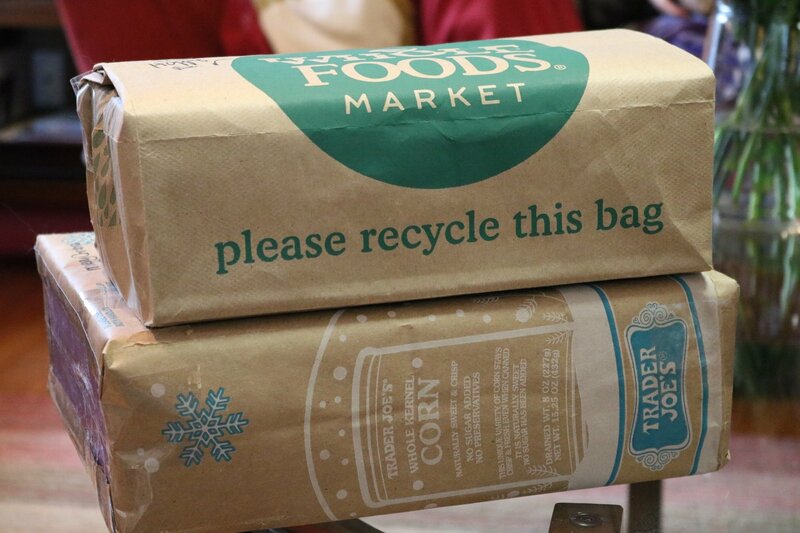 What steps can we take to reduce waste during the holidays? Is there a way we can focus more on experiences and enjoy spending time with one another this year? Can we reduce our energy usage this year? If so, in what ways? If we were going to start with just one way to go green this holiday, what would the first step be? Can we make plans to go green at least halfway next Christmas? If we continue to revisit our goal to be greener (I mean, it is Christmas after all!) how many years would it take to transition to a wholly green Christmas? Imagine how that would look. Reduce Stress and Do Less! Allow yourself to turn down some engagements if you need to slow down. It's hard to get in the holiday spirit when you are running yourself ragged. So plan some nights at home to watch Christmas movies while sipping hot tea or cocoa or if you enjoy it, have a baking night. Whatever you enjoy, allow yourself to connect with the season. 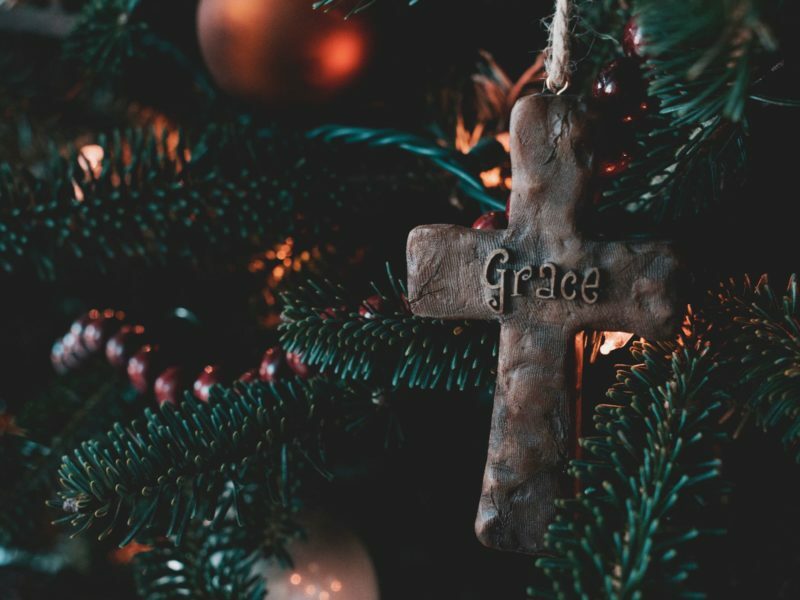 A great way to connect with the season is to have an advent tradition. Create one that is more than opening the door to a piece of candy. A read-aloud-book advent is a pleasant bonding experience; reserve a pile of books from your local library. How about a reusable advent calendar? Here is the one we've been using for years; each drawer contains a bible verse from the story of Jesus' birth. Schedule a Video Chat Caroling session – my brother-in-law and his wife often call to sing Happy Birthday or leave it on voicemail each year. Keep in mind that less is more. Resist the temptation to purchase excess “stuff” that will end up in the “declutter” pile later in the year. Instead, buy gifts that have a meaning or purpose. Some families choose to gift experiences rather than things. Try to plan a low key Christmas. Consider drawing names in your family and sticking to one gift per person so that each person gets a gift that was well thought out and meaningful. Playing the left right game with your friends or family is a great way to reduce the number of gifts at Christmas. When buying vintage or second hand gifts make sure to follow toy safety tips. 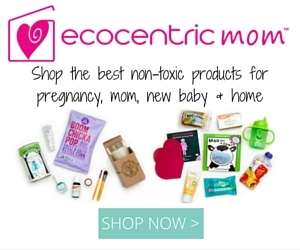 When buying gifts consider wood, organic cotton, and other natural renewable materials. If your family members are old enough, you might think about doing a handmade gift exchange. Knitting is enjoyable and reduces stress and results in a beautiful homemade gift. Support your local small business owners by checking off your gift list while shopping from independent artisans. Not only does this reduce your carbon footprint but you will be supporting your local community; best of all the gifts will be unique. Do your body a favor and choose non-toxic organic beauty products and makeup. We shop locally at Fresh Kale for soaps, scrubs, lotions and more. 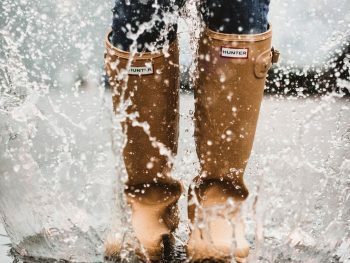 How about a buy one, give one company like Toms Shoes? When you buy shoes for yourself, they also donate a pair to a child in need. At a minimum, make an effort to buy gifts that are not made in China. Unfortunately, the reason China can make products so cheaply is that they ignore the environmental impact of their methods and materials. If you do order items (I know end up ordering things I can't find locally) remember you can recycle boxes by using Give Back Box to donate items which benefits many. For packing peanuts, you can reuse them yourself, or you can drop them off at a packing store where they will happily reuse them! 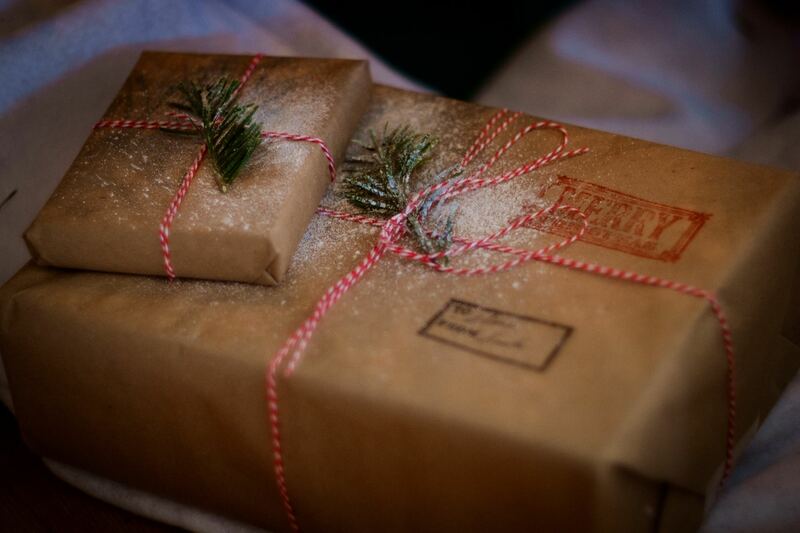 Wrap those gifts eco-friendly by using paper bags, newspaper, scarves, or beautiful cloth you find on sale. If you prefer wrapping paper over these options, look to responsibly sourced brands labeled FSC. All non-glossy paper wrapping can be recycled or shredded for the compost. Reuse bows and ribbons through the years. According to statistics, 85% of artificial trees come from factories in China where workers in less than ideal conditions make them from non-biodegradable plastics and metals. These fake trees cannot be recycled and eventually end up in the landfill causing a considerable burden to the environment. The petroleum used to make plastic for Christmas trees is also a non-renewable resource. Real trees are 100% biodegradable, and new trees can be planted each year by tree farms to replace ones sold at Christmas. Choose your tree from a sustainable farm to take it a step further. You can google your area for small-scale growers. Here's a list of Christmas tree farms in the area where we live, in Knoxville, TN. Here's a pick-your-own Christmas tree nationwide database. For those who enjoy Christmas lights, consider utilizing timers. Programming your lights to only be on during certain hours will reduce the amount of energy they use. If your lights are older than a decade, it might be time to upgrade to a more efficient strand of bulbs. When planning your holiday meals, shop locally from farms, farmer's markets, Christmas markets, and other local businesses. Look for organic farms in your area. Choose caterers that offer food made with organic, locally sourced ingredients. Choose responsibly sourced meats and avoid factory farms. You can even buy your wine, beer, and liquor from local brewers and distilleries! There's no shame in ordering some pre-made foods to save yourself the stress of cooking everything. Especially if you have family members or friends visiting with dietary restrictions or preferences. For holiday dinners, use real plates and utensils when possible. Recently we shopped our local thrift store and found beautiful plates in shades of ecru. Even though they don't match, we feel better about not using disposable. The dishes were very affordable at the second-hand stores at less than a dollar per plate. Plus, if one gets broken I'm only out a buck. It doesn't take long to hand wash a stack of dishes, plus its part of the holiday memory making! Decorate your table with potted plants, succulents, herbs and then let your guests choose one to take home with them. Not only are you making an eco-friendly choice, but you'll also score points for neatest party favors! 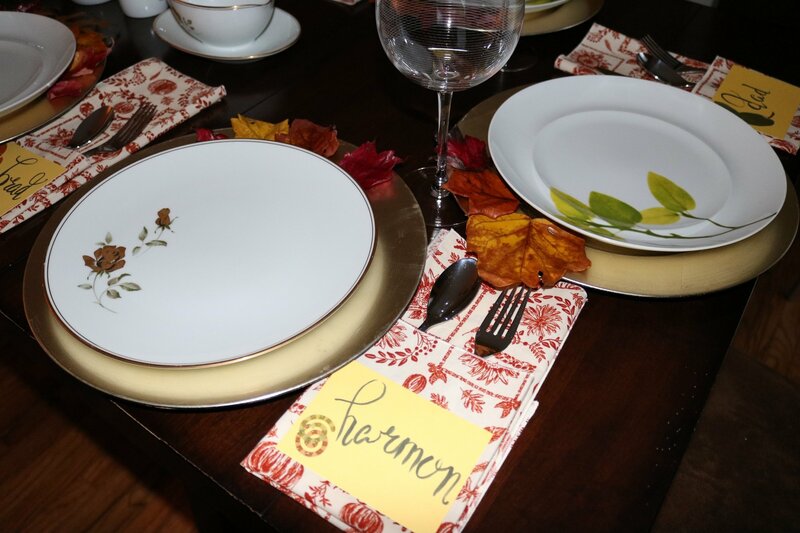 For Thanksgiving this year, I decorated the table with leaves that my daughter painted with mod-podge. A natural centerpiece made of pine wreaths, rosemary and beeswax candles is divine! Poinsettias may represent Christmas to many of us, but they typically don't last any longer than the holidays. Flower farms in Mexico and California ship the flowers to locations across the US making their carbon footprint rather large. Gardenias (my personal favorite), eucalyptus, hyacinth, and amaryllis are a few choices that are in season during December. If you must have Poinsettias, try to source them from local growers. Play the same board game each year as part of the tradition (Pictionary and Catan are family favorites) – make sure to have some snacks on hand. Have an arts and crafts night using natural materials such as wood, paper bags, etc. Become a storyteller for a night where everyone sits together with hot cocoa in front of the fire sharing stories from childhood.